It is well past the time for the obsession about cholesterol to be over. It turns out, Cholesterol is not the demon it was formerly made out to be. What it is…and what it is not. Cholesterol is a substance that circulates through the body in the blood. More important than how much of it is floating around is what type of cholesterol it is and what it is actually doing there. The different types of cholesterol can have completely opposite effects on your heart health. Cholesterol is actually crucial for many chemical functions in the body. Cholesterol is used to produce hormones like Estrogen, Testosterone, Progesterone Estradiol and Cortisol. It has a vital role in the formation and maintenance of cell membranes and Cholesterol helps to protect and insulate delicate nerve fibers. Cholesterol is not all good and it is not all bad. As with so many things in the health of the body, balance is key. The ratio of LDL to HDL is an important consideration in your total cholesterol number. There are different forms of cholesterol and each promotes a different response with your body. LDL cholesterol or Low-Density Lipoprotein is kind of ‘sticky’ in that it sticks to the walls of your arteries and builds up there causing restricted blood flow. This causes the heart to have to work harder to ‘push’ the blood through the narrowed channels. On the other hand, High-Density Cholesterol, AKA HDL is kind of like the street sweeper that cleans up the debris along the sides of the road gets rid of it. But in this case, HDL makes the rounds helping to sweep out the chunks of LDL that are sticking to the walls of your arteries and delivers them to the liver. So, what does the liver do with cholesterol? The liver uses cholesterol to make bile and then that bile is stored in the gallbladder. Bile is needed to absorb Vitamins A D E & K. These vitamins are fat soluble vitamins so they cannot be absorbed without fat. Bile breaks down the fat into small particles so it can be digested more easily. Genetics can play a role in elevated cholesterol levels, called familial hyperlipidemia. 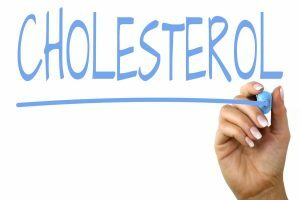 Due to minor abnormalities within certain gene pools; either the body produces TOO MUCH cholesterol or is unable to eliminate it leading to unsafe levels in the blood. When the liver has enough cholesterol to carry out its functions it reduces the number of LDL receptors that take in cholesterol so more cholesterol is left to circulate and build up in the blood. Remember, LDL is “sticky” so it begins to stick to the walls of the arteries and accumulate there as plaque. There are several things you can do right now from a nutrition and lifestyle perspective to get and keep your cholesterol in a range you can feel good about. Experts agree that stress can raise the ‘bad cholesterol’ through mechanisms that are not fully understood. So finding ways to lower your stress levels can help. Obesity raises your risk factor for elevated cholesterol, and Diabetes damages the inside of your arteries permitting the cholesterol to stick and build up there. so losing weight and keeping blood sugars levels stable is another way to help keep cholesterol levels in check. Smoking and Diabetes are both known to reduce HDL levels as much as 15% so quiting smoking can help raise your good cholesterol. On the other hand, vigorous exercise is one of the few actions you can take to increase HDL Levels. Exercise can also help with blood sugar control and weight loss so I call that a win-win-win. Improve your diet by reducing the amount of high sugar and highly processed foods & replacing some animal products with plant-based foods such as beans and legumes, nuts, seeds, fruits vegetables etc. The fiber in these foods also helps reduce your LDL. Cholesterol is vital to human life. Yet, too much and the wrong type of cholesterol can impact how well and how long you live. Don’t be afraid about cholesterol, be SMART about cholesterol. Learn what helps and what hurts and then do what you can to positively impact that.